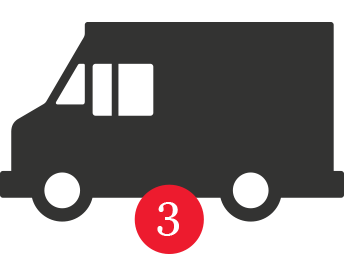 Have a home delivery question? Contact us. Enjoy the rewards and convenience associated with your new card. Ask in-store for details regarding the benefits you will receive. Enter just the 16 digits in the card number. Do not include any spaces. If you are registering more than one Moola Card, you cannot use the same username each card you register must have a unique username or the registration will not be accepted. Oberweis Moola cards may be used at all participating Oberweis Ice Cream and Dairy Store retail locations only. Purchases made through Oberweis Dairy's home delivery service or other retail stores do not accrue points. 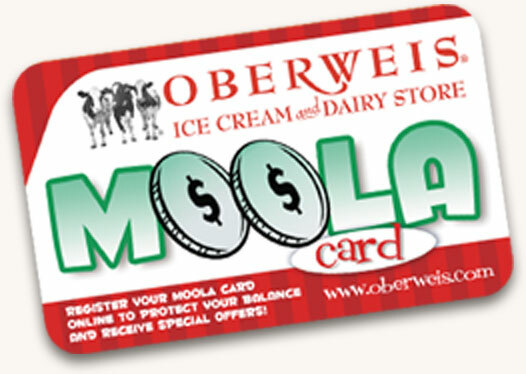 Moola Cards are only available for use at participating Oberweis Ice Cream and Dairy Store locations and cannot be applied as credit towards items purchased through the Oberweis home delivery service. Cost to participate in the Moola Card rewards program is $1.00. There is no charge to participate when the card is used as a stored value card and an initial amount of $5.00 or more is placed on the card. Product, merchandise or gift card purchases are required to earn points. Card or registered card number must be presented at the time of purchase to earn points. Points cannot be issued retroactively. Unregistered cards will not be replaced if lost or stolen or used without your permission. Cardholders earn one point for every dollar spent at participating Oberweis Ice Cream and Dairy stores on products, merchandise or gift cards. The receipt for the transaction will show the points credited to the cardholders account. Points may be earned only by the Oberweis Moola cardholder that pays the check. When a cardholder obtains enough points to earn a reward, the reward will automatically be printed on the receipt. Cardholders do not need to present a receipt to receive a reward. 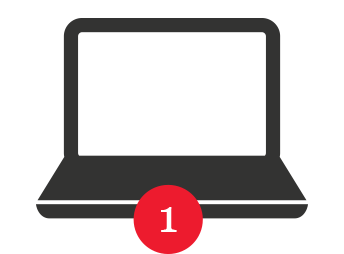 Rewards are stored by the computer system and are automatically updated. Rewards are non-transferable, not redeemable for cash, and must be redeemed for the selected items. No substitutions are allowed. Flex dollars may not be used to purchase gift cards or pay bottle deposits and gift cards cannot be used to purchase gift cards. Voided items will reduce the points by the voided amount until the point total reaches zero. Points cannot be transferred from unregistered cards. If the program is experiencing technical difficulties, points will continue to accrue, and will be applied to accounts once the program is running again. If the program is experiencing technical difficulties, gift card and stored value cards may not be able to be issued or redeemed. 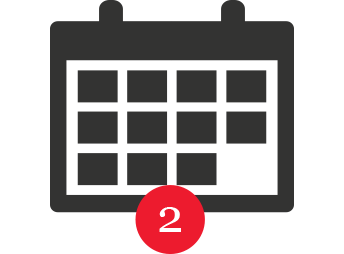 Rewards will expire 120 days after issuance. The Oberweis Group Inc. can, at its discretion, modify the program rewards or substitute rewards of comparable value without notice. The Oberweis Group Inc. reserves the right to discontinue this program at any time. In the event that this program is discontinued, cardholders will be allowed to redeem any rewards that they have already been issued, prior to the stated expiration date. The Oberweis Group Inc. reserves the right to discontinue membership privileges and void a cardholder's point balance and rewards if any unauthorized points are earned or redeemed, or there is any unauthorized use of the program. Oberweis Moola points will expire 12 months after the first day of non-use of the card. The Oberweis Group Inc. also reserves the right to discontinue membership privileges and/or void a cardholder's point balance, if that cardholder's account has shown no activity for a period of 12 months. Employees of The Oberweis Group Inc., Oberweis Franchise Systems, LLC, Oberweis Dairy, Inc., Oberweis Asset Management or their affiliated companies or agencies and their immediate families are not eligible to participate. Cash value cannot be transferred from unregistered cards. Oberweis Dairy, That Burger Joint and Woodgrain Pizza Gift Cards may be used at all participating Oberweis Ice Cream and Dairy Store, That Burger Joint and Woodgrain Pizza retail locations. Gift cards cannot be used for the purchase of products through Oberweis Home Delivery service. Your gift card must be presented at the time of purchase to redeem. Forgot your password? If you are having problems logging in, click here. Please do not save a link (bookmark, favorite) to this page. This is just the login page. If you would like to bookmark a page on this site, wait until after you have successfully logged in. How likely is it that you recommend Oberweis to a friend or colleague? More convenient than cash, gift cards are convenient for everyday purchases and also make a great gift. Gift cards are available to use for purchases at all Oberweis Ice Cream and Dairy Store, That Burger Joint and Woodgrain Pizza locations. Purchase cards in store, or online. Gift cards are not redeemable for purchases made at any other retail locations or via Oberweis Home Delivery. Use your Moola Card when you make purchases at any participating Oberweis Ice Cream and Dairy Store location, and you'll earn points for what you buy! When you earn 300 points, you will automatically receive 3 FLEX DOLLARS to use just like cash toward the purchase of any Oberweis Dairy product or merchandise. The Moola Card can also be used as a gift card. You can keep reloading it so you never run out of treats! Give the gift of Oberweis to your favorite ice cream lover! You can purchase gift cards at any participating Oberweis Ice Cream and Dairy Store location or by calling 1-866-OBERWEIS (866-623-7934) in any amount you choose (minimum $5). The card can then be redeemed at any Oberweis Ice Cream and Dairy Store location. When the card is redeemed, the gift recipient can immediately begin to use the card as a loyalty card and start earning points toward rewards. Give yourself the gift of Oberweis super premium ice cream, milk and other dairy products by loading money onto your card and using the card to pay for your purchases. No need to carry cash when you get a craving for the world's best ice cream.